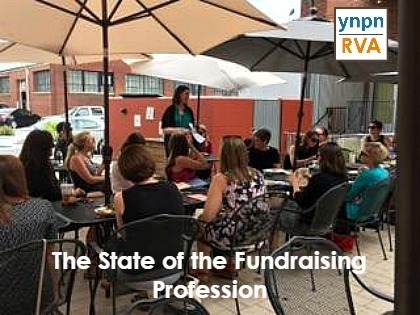 In case you missed it – here’s a look at this past week’s YNPN RVA Table Talk – a casual and informal discussion opportunity, where we explored “The State of the Fundraising Profession”. Abbi Leinwand Haggerty, Director of Development for the Partnership for Nonprofit Excellence and recent PHD graduate in Public Policy and Administration from VCU, shared her recent research on turnover intentions of fundraisers. Work for an organization that has a mission that excites you – museum jobs weren’t a great fit for me but now I’m at a place that totally is! Today’s fundraisers operate within a nonprofit sector that has experienced tremendous growth in recent years. The sector now employs nearly 10% of the U.S. workforce, adds $887.3 billion to the U.S. economy (which is 5.4% of our GDP), earns $2.16 trillion in revenue, and holds $4.84 trillion in assets—an increase of 21.5% from 2002 to 2012. There are over 30 types of tax-exempt organizations in the U.S., with those having the 501(c)(3) tax designation comprising the largest category (approximately one million of the 1.44 million registered nonprofits). Most of these public charities tend to be small with 40% having less than $100,000 in annual expenditures. The sources of revenue for the sector are diverse and vary by organizational type, but for the sector as a whole, close to 13% of all revenue comes from private donations, which of course is typically the primary focus of the fundraisers’ profession. A further breakdown of private contributions shows that the highest percentage goes to religious organizations, followed by education, and human services. And approximately 67% of all U.S. households make philanthropic contributions, which totaled over $335 billion in 2013. What’s Causing Turnover in the Field? A report from UnderDeveloped stated that “the development director is commonly labeled a ‘revolving door’ position, and ‘the hardest to fill and retain’ by executives, board members, funders, and capacity builders alike.” Half of the development directors surveyed in the report planned to leave their job within two years, and 40% were not even sure that they would remain in the field of fundraising at all. A related survey of executive directors of nonprofit organizations revealed that when a development director does vacate a position, the average length of the vacancy is six months. In the search to fill these vacancies, 53% of executive directors reported difficulty in finding enough qualified candidates to interview. So, why does turnover in the fundraising field matter so much? It matters, and has been described as an epidemic, not only because of the direct costs of turnover (those costs associated with advertising the job, hiring a new person, etc.) but because of the indirect costs, which include the loss of relationships with donors, potentially resulting in the loss of gifts for an organization. And perhaps most importantly, turnover in fundraising positions not only impacts nonprofit organizations, it impacts the clients they serve. Fundraisers are responsible for raising the funds necessary to keep programs running, ensuring the quality of services offered, and with their departure comes the potential loss of program revenue and continuity. Considering that many of these programs and services are “public” in nature, having been contracted out through the public sector, the impact of lost revenue resulting from turnover oftentimes means people are left in need of critical government services. From these findings, there were two big areas she looked at in terms of implication—what did this mean for fundraising as a profession and what did this mean for individual fundraising positions? Taking a high level look at these responsibilities and job tasks, it becomes clear that being able to “ask for money” is not the only job skill that a fundraiser needs to master in order to be successful in a top-level development position. And from the perspective of person-job fit, as an example, fundraisers who are highly skilled in donor research may not be as highly skilled in volunteer engagement. However, if those fundraisers are asked to take responsibility for both functions of the organization, they might struggle with determining if the job is really a good fit even if one of these functions is highly aligned with their abilities. So, if fundraisers across the sector are tasked with multiple responsibilities like these that may not naturally align under the skill sets of one person, it is not difficult to see why low levels of perceived person-job fit might lead to fundraisers leaving the career altogether. The assignment of such varying responsibilities and tasks also speaks to the limited resources, including human resources, with which many nonprofits have to accomplish their missions. The data in this study revealed that among those fundraisers surveyed, the organizations for which they worked had, on average, 3.4 full-time employees dedicated to fundraising, while the most commonly given response was one. For perspective, the average annual operating budget for organizations in the survey was $15 million while the most commonly given response was $2 million. If these organizations require their fundraiser(s) to employ multiple methods to secure the private philanthropy that supports these budgets, but have just several fundraising employees (or only one) on staff, then the pressure is placed on these few fundraisers to excel at multiple tasks that may not require the same skill sets or skills that would naturally align. For individual fundraising positions, this study and others have found that fundraisers are often “compartmentalized” in their organization; their job is not well understood; and their role is seen as just to raise money for the organization. These conditions led to dissatisfaction on behalf of the fundraiser and the organization. A large part of organizational culture is based on value congruence, and employees whose values match those of their organization remain more committed to the organization. If fundraisers are not incorporated into the larger team of employees in the organization, and do not feel that their responsibilities align with others in the organization, then this isolation may be what results in fundraisers not perceiving a high level of fit between the organizational culture and their own values. In the nonprofit sector, as demonstrated in this study, perceived person-organization fit is a different construct than culture of philanthropy and mission attachment. The data from this study revealed that the larger organizational culture is predictive of turnover intentions among fundraisers rather than the specific culture of philanthropy that an organization may or may not have. Fundraisers may perceive that without high perceptions of fit with their organizations, in general, a culture of philanthropy is secondary to overall value congruence. Likewise, an organization’s mission statement is not always reflective of an organization’s values. So, while an employee might be passionate about a certain mission, or field of work, they may find that an organization, other than their own, with a similar mission and purpose, has a better organizational culture for them. We need to advocate for fundraising as a true profession that has a respected body of knowledge and practices so that people we work with understand that our experiences and skill sets are valuable and have been developed over time through education, training, and practice. Fundraising is more than just asking people for money. When fundraising is seen as a professional career, I think we’ll find more formal education opportunities available as well as further training and professional development opportunities. It’s become fairly common now to be able to seek out a master’s degree that offers at least a concentration in nonprofit studies, but other than a class or two offered, there is typically not much focus on fundraising in the classroom. With more education and training available, people will better understand the skills required to be a good fundraiser, and maybe better decisions will be made about both the design of fundraising jobs and the decision to seek out and accept certain fundraising positions. Not everyone is going to want to take a job as a generalist in the development field. Some people will be better suited if they can find a job with a focus in one area of development, such as prospect research or major gifts fundraising. But a better understanding of the multi-faceted fundraising profession is necessary for job seekers and those hiring. This requires adequate funding for staffing and staff development—we need an understanding from funders that this is important, especially from government funding which comes with limited indirect costs rates. The general culture of an organization is super important. Fundraisers who feel that they’re not matched up with the culture of the organization, who maybe feel isolated in their roles, are more likely to leave. It’s critical to understand culture during the interview process—ask to talk to more people in the organization, see the work spaces, and ask how things get done. Don’t make assumptions. Often we get caught up in the notion of nonprofit organizations existing to do good work, and while that’s true, the internal culture of an organization, the way it operates, can take on many forms in accomplishing this good work. This field is not diverse. While person-organization fit is important, it doesn’t mean that organizations should only hire people who look like or act like or have similar backgrounds to current employees. We, as fundraisers, and really as anyone working in the nonprofit sector, need to commit ourselves to building more inclusive work places in our sector. The findings from Abbi’s research really resonated with many of the YP attendees who currently work in the fundraising profession, and many spoke up about their own experience and issues that are common in the field and are prevalent in Greater Richmond. So, Why are We Fundraisers? Because we must speak for those who cannot speak for themselves. It is our duty to protect them and help them in any way that we can. Because we know that our nonprofit missions cannot succeed without fundraising. Because we want to be executive director someday and we know that fundraising must be a piece of any nonprofit leadership role. Because we are all looking for more meaning and hope in our lives. Because connecting people with our mission allows us to help people have more meaning in their lives through giving to us. Because people who give live longer, healthier lives. Because being a cheerleader for compassion is pretty neat. Just think about it. You’ve got your whole life to fundraise. There are so many causes you will get to help. There are so many ways you can serve, and ways you can help others serve. You are making the world better, every day. And that is pretty magical. Want more opportunities to learn with YNPN RVA? Come to our next signature event on June 24th – “Mentoring Matters: Using Mentoring as a Tool For Professional Development” at Richmond Memorial Health Foundation!